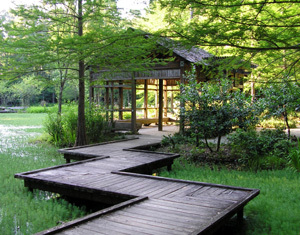 When I lived in Texas (in a suburb north of Houston), I longed for a lovely place to walk. I found such a place in a neighboring Arboretum. I was drawn to this quiet structure nestled among the trees and flowers. The jagged pathway reflects our varied journey through life. While visiting a friend in Las Vegas, we went to Red Rock in Nevada. The small white specks are the people climbing the rocks – they are dwarfed by the rocks. 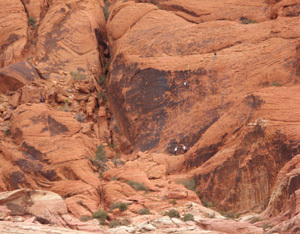 At Red Rock, the rocks are other colors as you see in this image. 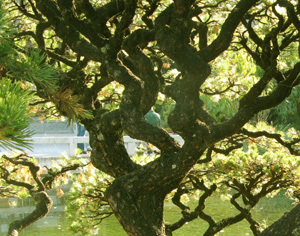 In Portland there is a lovely Chinese Garden that I enjoy visiting. 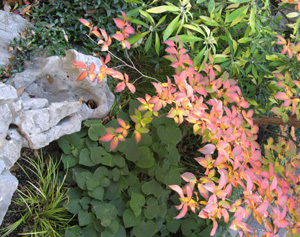 The textures and colors of the trees and plants are beautiful in autumn. All images are copywrite 2011 by Karen Devers and not to be used without written permission of the artist.